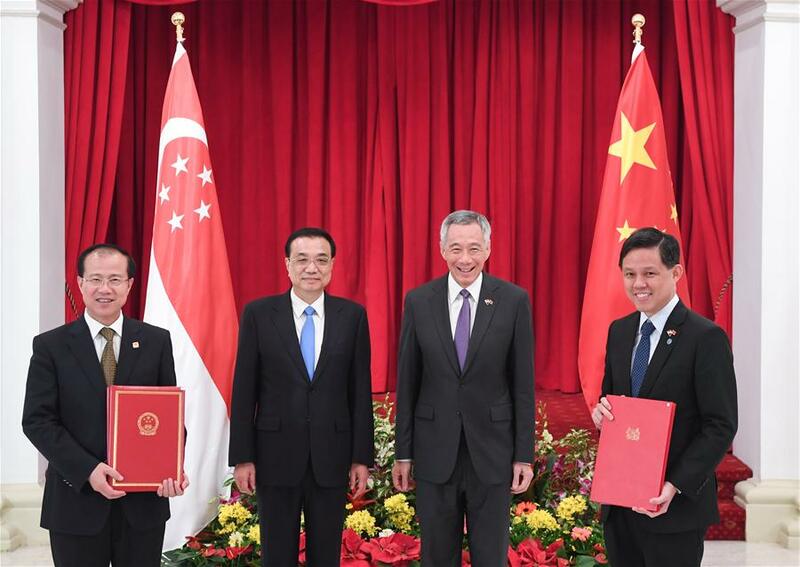 SINGAPORE, Nov. 12 (Xinhua) -- China and Singapore on Monday signed a cooperation document on upgrading the two countries' free trade agreement (FTA) as the two sides had finalized the negotiations. Chinese Premier Li Keqiang and Singaporean Prime Minister Lee Hsien Loong witnessed the signing of the document after holding talks. Li arrived here earlier Monday to start his first official visit to Singapore, where he is expected to build momentum for free trade and regional cooperation. When meeting with Lee, the Chinese premier expressed the hope that the two sides seize the opportunity of the finalization of the FTA upgrading negotiations and lift two-way trade and investment to a higher level. Upgrading the FTA will bring about real benefits to people and companies of the two countries and send to their business circles a strong signal of further expanding trade and investment, Lee said. On the occasion of signing the FTA upgrading document, the two sides also signed cooperation documents on connectivity, finance, science and technology, environment, culture and customs. During the visit, Li is also going to attend the 21st China-ASEAN (the Association of Southeast Asian Nations) (10+1) leaders' meeting, the 21st ASEAN-China, Japan and South Korea (10+3) leaders' meeting and the 13th East Asia Summit.